GameSpy online server browser has been shut down. See GameSpy Alternative below for a fix. Improves SWAT 4 experience by adding cut content, better AI, more equipment, multiplayer features, general bugfixes, QOL improvements and much more. 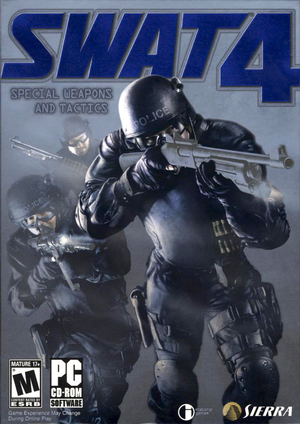 Download and extract the newest full version of SWAT: Elite Force inside SWAT 4 directory. 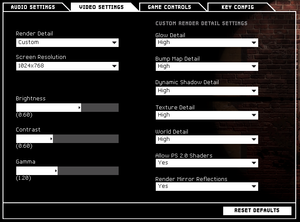 Download and extract the newest patch for your version of the mod and extract it inside SWAT 4 directory. User should extract the SEF folder itself and not its content. Root folder should look like this after successful installation. 85°, Vert-. See Field of view (FOV). Can cause text chat to have hidden/invisible text. The following prevents resolution being reset. No need to make your configuration file read-only. Editing SWATPawn.ini may not allow people to join your server. Open SWATPawn.ini (make sure you have run the game at least once). In this section adjust line FirstPersonFOV=. Not recommended to edit as this will cause sensitivity issues when using gadgets like the optiwand. In this section adjust line LevelOfAnisotropy=1 (maximum is 16). In this section set Use3DSound to True. Download OpenAL Soft and copy soft_oal.dll (bin\Win32) into the same folder. The game use by default openAl with a Directsound 3D output. Do not delete or replace the gamefolder DefOpenAL32.dll when using this method, using a more recent openAL32.dll will crash the game (trying to use a native hardware openAl by tweaking "AudioDevice=" too). Use creative alchemy or similar DirectSound3D restoration software. Some users with multiple monitors have issues with their screens flickering. Unplug your second monitor's cable that goes to your graphics card (unplugging the power cable is not enough) and start the game. Alternatively, press ⊞ Win+P to bring up the display switch dialog (on Windows 7 and up), and disable the secondary monitor. Alternatively, run the game with the -nointro parameter, after having run the game at least once before with any additional monitors disabled. Alternatively, launch the game windowed (see Windowed and Widescreen resolution if you don't know how), then once on the main menu press Alt+↵ Enter to return to fullscreen. This page was last edited on 16 April 2019, at 01:54.